For its convenience of creating diagrams and visualized presentations, people from all walks of life can apply Edraw in their work. As a comprehensive diagramming software, Edraw is especially suitable for businessmen. At the same time, for its convenience of creating diagrams and visualized presentations, people from all walks of life can apply Edraw in their work. Afterwards, many occasions require visualization processing. Edraw diagram software will make it easy and precise no matter for drawing floor plan to perfect your house, or drafting a work flow diagram in your office. The very reason for its success is that Edraw provides abundant symbols and templates and adopts simple drag-and-drop operation for users, so that drawing can be quick, simple and professional in appearance. Edraw users don't have to be drawing artists, but only need to find suitable symbols or shapes and drag them to the drawing page. And then change properties of objects to meet their requirements. Examples of Edraw are also very abundant, like thousands of shapes in existing templates are available for users. Moreover, users can create their own shapes. 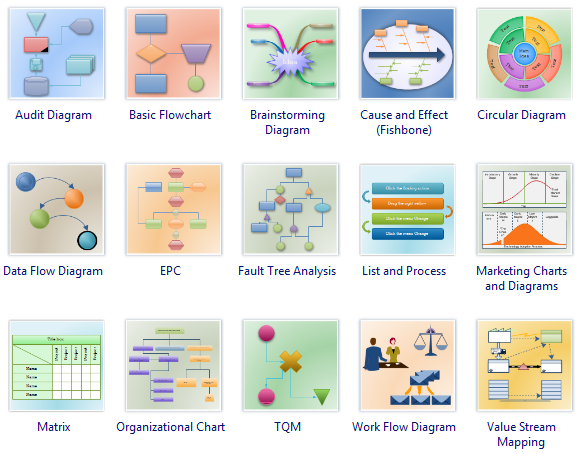 Intelligent symbols are indispensable tools when drawing different kinds of diagrams, from common Business Process Diagram to complex Organization Structure. Edraw symbols are vector more than clip arts that won't change shape by size changing. Users can also connect shapes together and add texts on them to create new object. Users can add data, hyperlink and notes to symbols as well. Edraw drawing software are useful for businessmen, experts to deal with all kinds of activities. Designers, Business managers, market executive staff, architects, Internet experts, security system experts, engineers and pharmaceutical and environmental staff can use Edraw products. Apparently not all kinds of fields are mentioned here. In a fiercely competitive global market, more and more people began to realize that Edraw tools are an indispensable part for planning and designing.